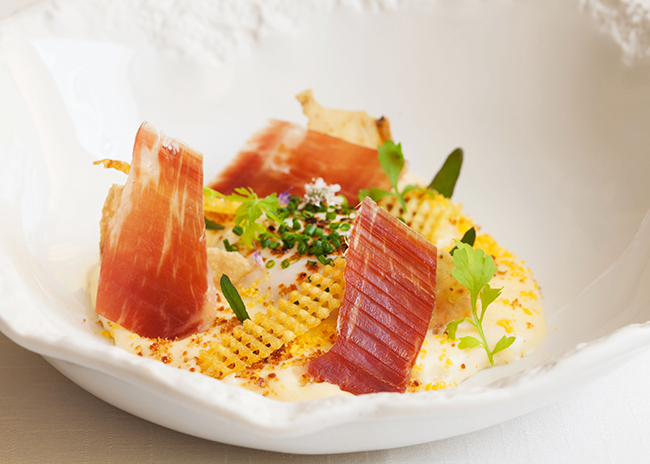 The connection of Cinco Jotas with haute cuisine is nothing new. 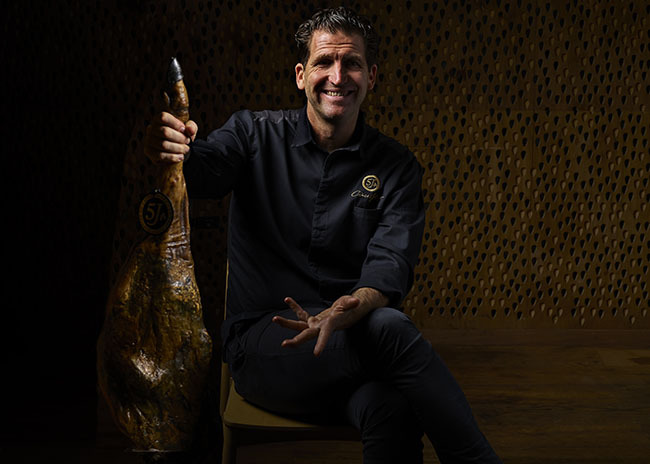 Uniting the heritage and tradition of an iconic label such as Cinco Jotas with avant-garde cuisine is a challenge that has already been successfully tested by renowned professionals such as Chefs Pedro Subijana, Da Dong and José Pizarro. Under the new concept Cinco Jotas by… however, new and interesting paths of culinary experimentation have been opened for both prestigious chefs and for Cinco Jotas restaurant patrons. Alexandre Mazzia was the first chef to accept this challenge: design a high-end, gourmet menu using Cinco Jotas products that expresses his more personal and creative culinary impulses. The Cinco Jotas menu by Alexandre Mazzia will be available from the second half of October at Cinco Jotas restaurants in Madrid, Barcelona and Seville, Spain. Gastronomy enthusiasts who try this menu will enjoy a double advantage: experiencing the excellent work of France’s“chef-of-the-moment”, Alexandre Mazzia, without having to travel to his restaurante AM in Marseille or his bistro “Pointe Noire” in Aix-en-Provence; and also, to savour some dishes that fully express their admiration for the Cinco Jotas universe. Cinco Jotas by Alexandre Mazzia starts with a luxury starter: a sampling ofCinco Jotas acorn-fed 100% ibérico ham accompanied by a subtle Coquinero, a fine sherry from Puerto de Santa María, Spain. Mazzia assures guests that Cinco Jotas acorn-fed 100% ibérico "is a product unique in the world for its colour, texture and delicate flavours that transport you directly to heart of nature". Then we come to the next culinary treasure: Cinco Jotas ham with a free-range egg cooked over low heat, along with a spicy potato puree curry with toasted hazelnuts. This dish is paired with a magnificent Montecillo Gran Reserva. According to Mazzia, "this dish aims to offer a combination of simplicity, enjoyment, and exceptionally harmonious flavours.". Now we arrive at the main dish: presa ibérico (shoulder cut) tartar with fine herbs and red pepper with sweet and sour sauce, cashews and mustard. Alexandre Mazzia emphasizes that Cinco Jotas acorn-fed 100% ibérico hamis "a perfect choicefor ham tartar. 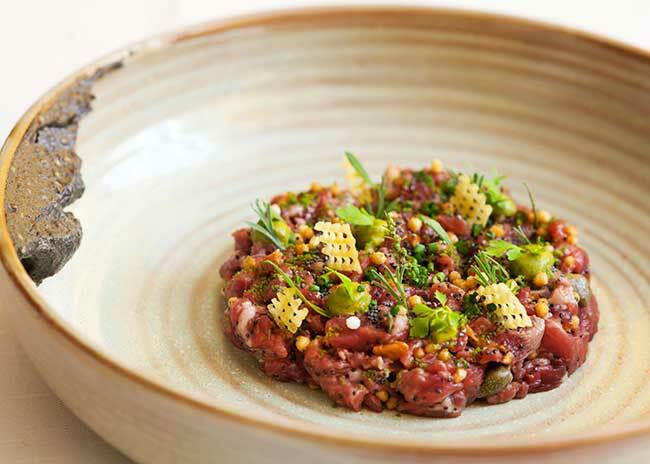 Many consumers are accustomed to a veal tartar butcan’t imagine how superb the presa (shoulder cut) is for this type of dish. Its texture is close to that of traditional Iberian ham, and it is so delicate that it ends up melting in your mouth ". To accompany this dish, clearly there’s nothing better than Montecillo Gran Reserva, Special Selection. The finishing touch is the surprising combination of wasabi, avocado and banana accompanied by a flan covered ina tonka bean-infused milk sauce, served with a glass of Santa María Cream wine. The exclusive Cinco Jotas by Alexandre Mazzia menu will be available by reservation only in Cinco Jotas restaurants every Thursday from 15 October for a price of € 75, including wines.